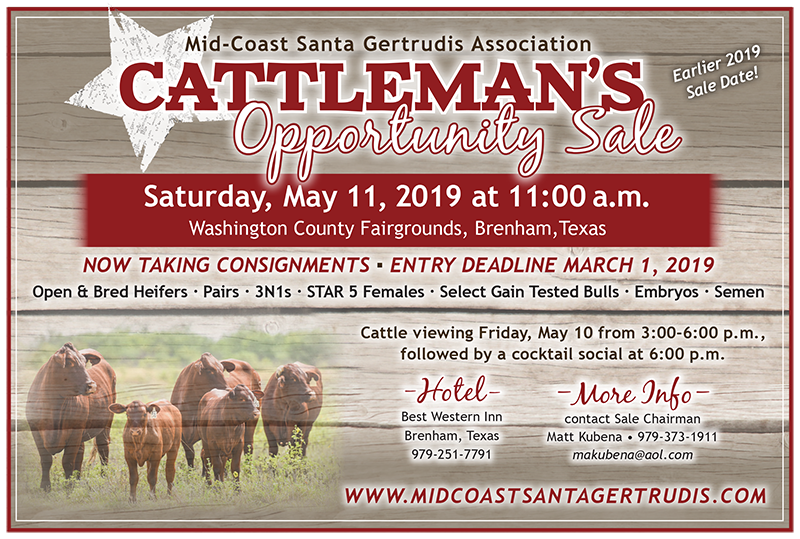 Hosted by the Mid-Coast Santa Gertrudis Association, will be held Saturday, May 11, 2019 at 11 a.m. at the Washington County Fairgrounds Sales Facility, Brenham, TX. This sale is open to consignment by all Mid-Coast members. If you are not a member, we invite you to join and bring your very best to Brenham. Click here for the consignment form. Plans are underway for the 2019 National Junior Santa Gertrudis Show (NJSGS). Join fellow NJSGA members for the show at the Brazos County Expo in Bryan, Texas. The Mid-Coast Santa Gertrudis Association is excited to bring the NJSGS back to Texas and can’t wait for you to join in the Texas Two Step. More information, including a schedule and registration information, will arrive in future issues of SG USA. For more information, contact David and Christy Moran at moran_fam4@yahoo.com, or call David at (979) 251-0391 or Christy at (979) 203-0433. To make a donation for the benefit of the NJSGA, click here. Chartered in 1954, the Mid-Coast Santa Gertrudis affiliate is one of the most active organizations within Santa Gertrudis Breeders International (SGBI) with over 100 active members. Since the inception, members have dedicated themselves to enhancing and promoting the Santa Gertrudis breed of cattle, as well as supporting this great organization. The major emphasis of the Mid-Coast affiliate is to promote improved breeding, production, and the sale of Santa Gertrudis cattle. In addition to sponsoring two annual sales – the International Super Sale held during the Houston Livestock Show and Rodeo in the spring and the annual Cattleman’s Opportunity Sale, Mid-Coast annually hosts The Aisle Party prior to the International Super Sale. In 2019, Mid-Coast is also happy to host the SGBI National Junior Santa Gertrudis Show with the theme, Texas Two Step! To enhance communication and education among the members, a quarterly newsletter, The Cattle Rattle, is published along with hosting an annual membership meeting and seasonal field days. Mid-Coasts’ junior program is a top priority. With the assistance of a youth advisor, the Mid-Coast Board sponsors a Jr. Heifer Show in the spring as a warm-up for the annual National Junior Santa Gertrudis Heifer Show, as well as providing buckles and premium money during the Houston Livestock Show and Rodeo Jr. Santa Gertrudis Show. The affiliate’s junior membership annually elects junior officers, a queen and a princess at the spring event. They publish their news in the Cattle Rattle and online; and organize fundraisers for member-based activities. In addition, educational scholarships are provided annually to deserving junior members. Santa Gertrudis cattle were developed in Texas by the King Ranch. This beautiful red cattle breed combines beef production and Texas hardiness into one dynamic package for serious cattle ranchers. For more information regarding the history of the breed, click here. We did not send it. Not sure of this story or request.